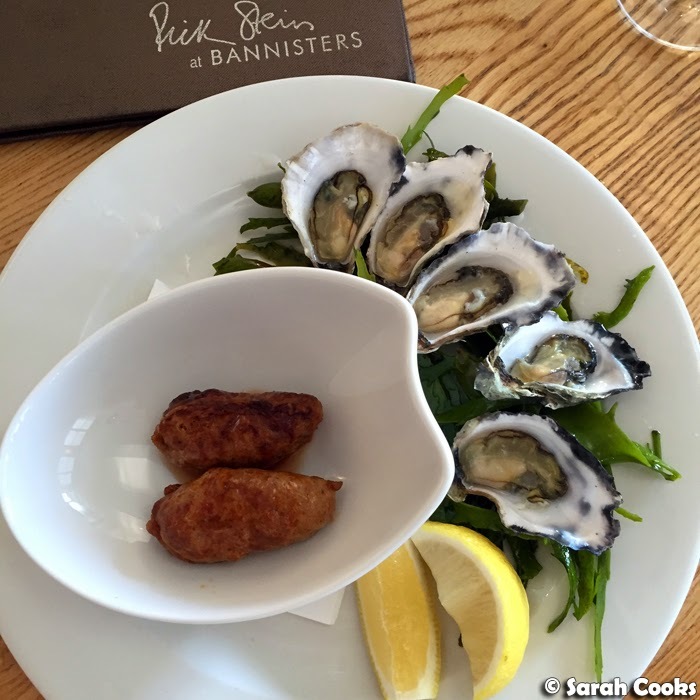 On our recent lovely weekend in Jervis Bay, the culinary highlight of our trip was dinner at Rick Stein's restaurant, at Bannisters Hotel in Mollymook. We hadn't planned on doing any blow-out dinners on our weekend away - indeed, I hadn't done any research and didn't even realise that Bannisters was near Jervis Bay. Whoops. 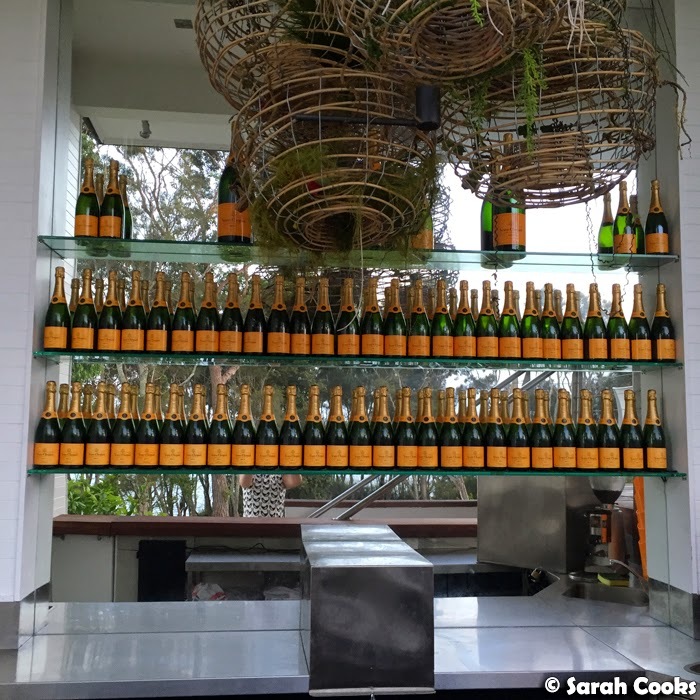 However, as we were driving to our accommodation from the airport, I saw a billboard for Rick Stein at Bannisters and was super excited to realise that we could visit it on our weekend! I was nervous suggesting the restaurant to Kimba and Sandra - neither are big seafood eaters, the restaurant was a good hour's drive away from our accommodation, it is quite expensive, and reviews had been mixed - but they were both up for it, so I rang the restaurant and booked a table for the final night of our trip. Luckily we all ended up really enjoying the meal and the restaurant. Hooray! So, Mollymook. 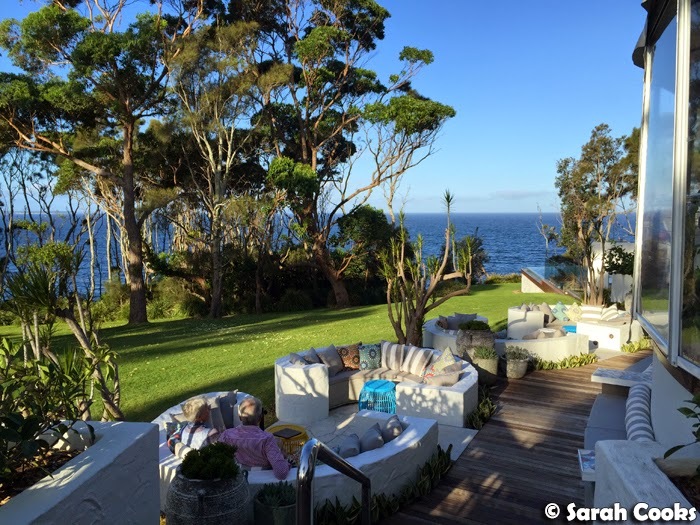 It's a small seaside town about three hours' drive south of Sydney on the south coast of New South Wales. 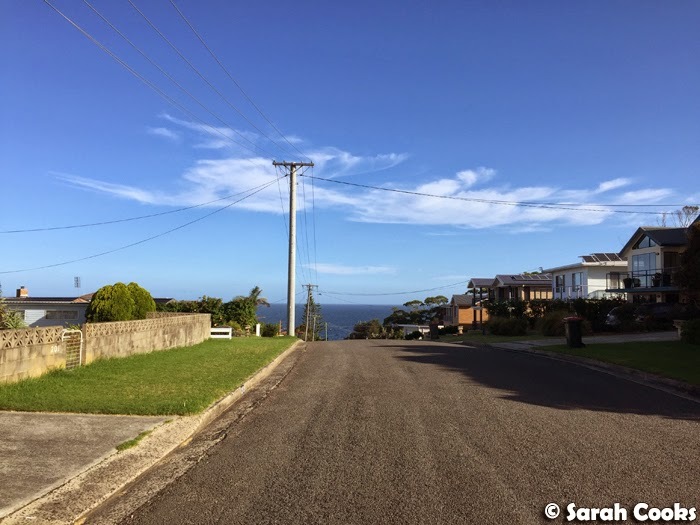 Driving there, it looked perfectly pleasant and suburban, reminding me of Donvale or Glen Waverley here in Melbourne.... until we drove up a hill and saw the gorgeous blue water. I can definitely see why Rick and Sarah Stein decided to open a business here! The restaurant is part of Bannisters Hotel, and you have to walk through the guest lounge to get to the restaurant itself. 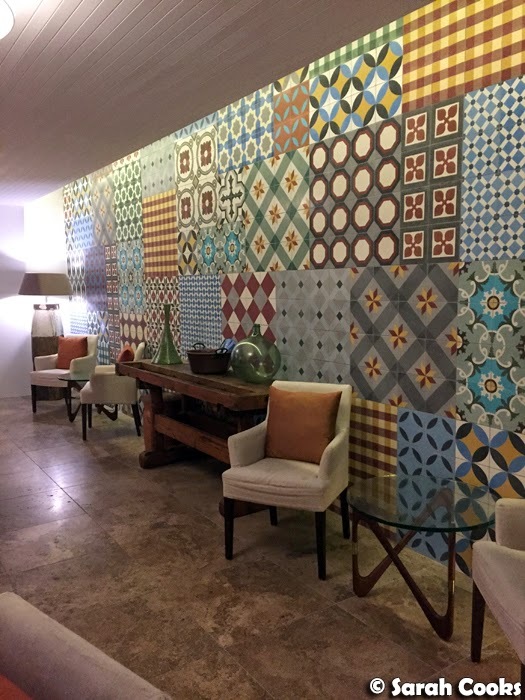 When we arrived, there happened to be an elderly gentleman guest in a (slightly open) bathrobe walking through, which led to me very pointedly staring at the wall and saying a little too loudly: "Oh what lovely tiles!" Tee-hee-hee. I thought the views from the restaurant were just stunning. And this next view really took my breath away! 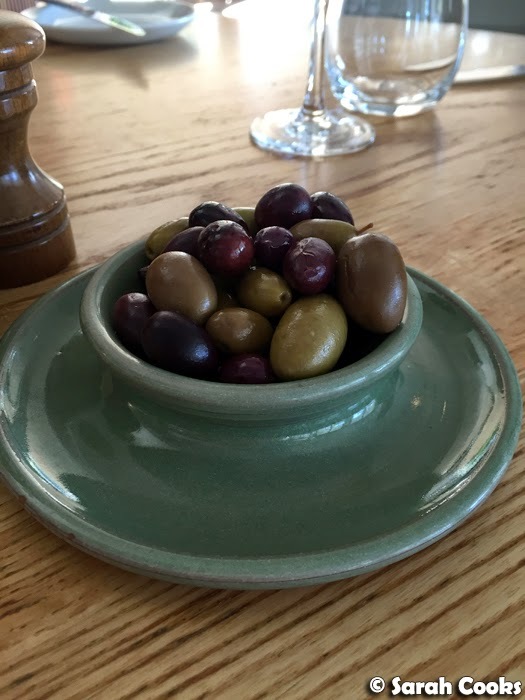 We started with a tasty selection of olives, and bread baked in-house. 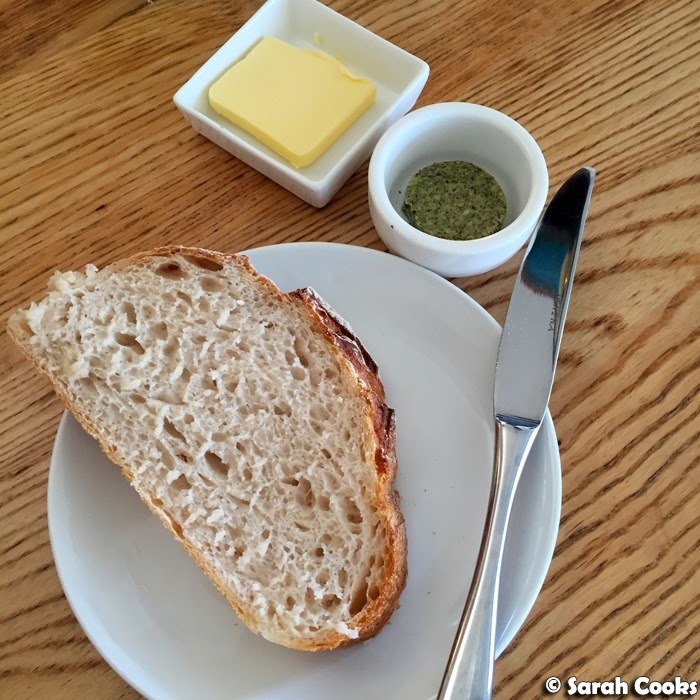 The bread was fantastic! Warm, crusty, chewy, delicious. I loved slathering on the soft salted butter and the soft seaweed butter. So much umami richness. 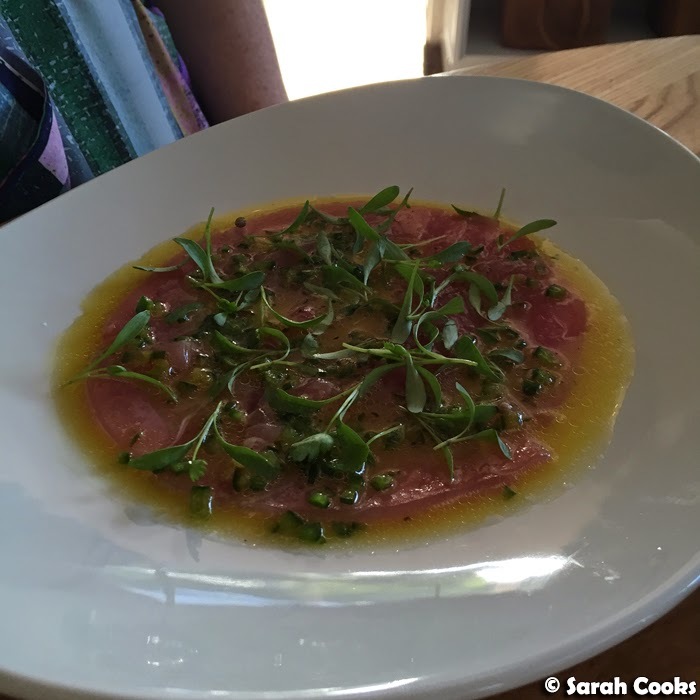 Kimba's entrée was a dish of raw tuna, marinated in passionfruit, lime and coriander. The tuna was incredibly fresh, and Kimba loved the unusual addition of tart passionfruit to a ceviche-style dish. 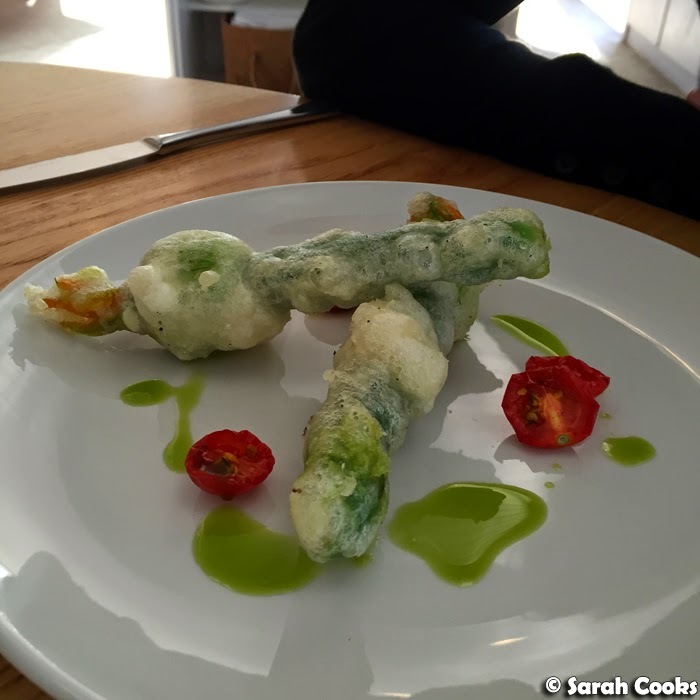 The zucchini flower entrée that Sandra ordered was very tasty - crisp zucchini flowers stuffed with mozzarella, Parmesan and pine nuts. 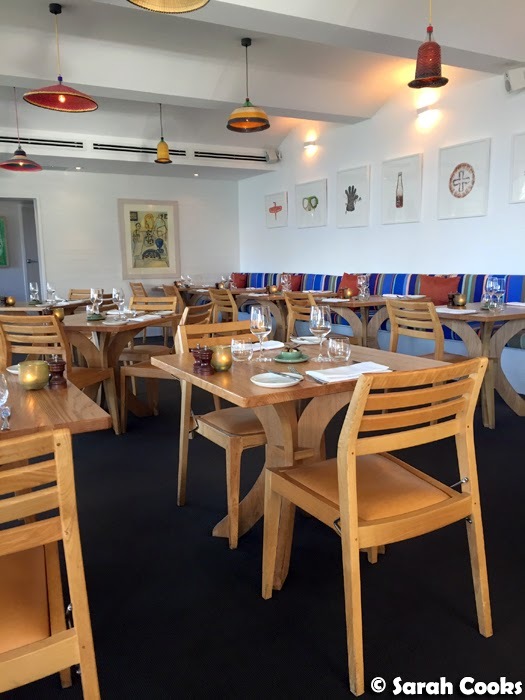 It also happened to be the only vegetarian dish on the menu (excluding sides) - Rick Stein at Bannisters is definitely a seafood restaurant - so if you're dining with vegetarians I'd suggest ringing the restaurant first to make sure they can accommodate. I absolutely loved my entrée, the oysters Charentaise. These were five freshly shucked oysters, served with two spicy sausages. (Incidentally, it looks like they've reduced the portion size - I saw on Lorraine's blog last year that it used to be half a dozen oysters and three sausages for the same price). The sausages were extremely juicy, and very spicy, even by my chilli-fiend standards. I thought they were fantastic! Even now I can still remember the taste of those sausages - just gorgeous. I generally prefer oysters natural (I think mornay or Kilpatrick tend to overpower the oysters), but these were a great compliment. Sandra and Kimba both went for the only non-seafood option as their main, this glorious behemoth of a steak. It was a 450 gram rib eye, served on crispy potato squares, with a deeply savoury onion gravy. So delicious! That sauce was seriously good! 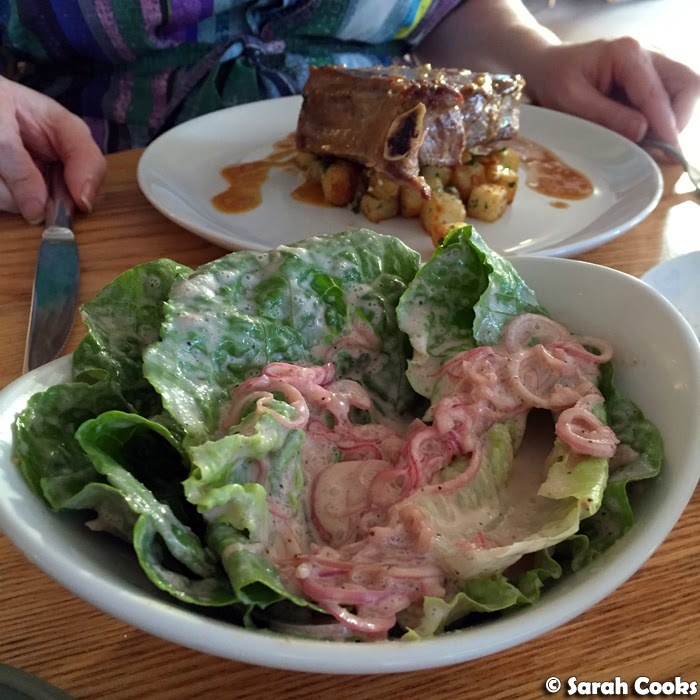 Each steak also came with a generous "Cheesemaker's salad" on the side - cos lettuce with shallots and a creamy Cabernet Sauvignon vinaigrette. 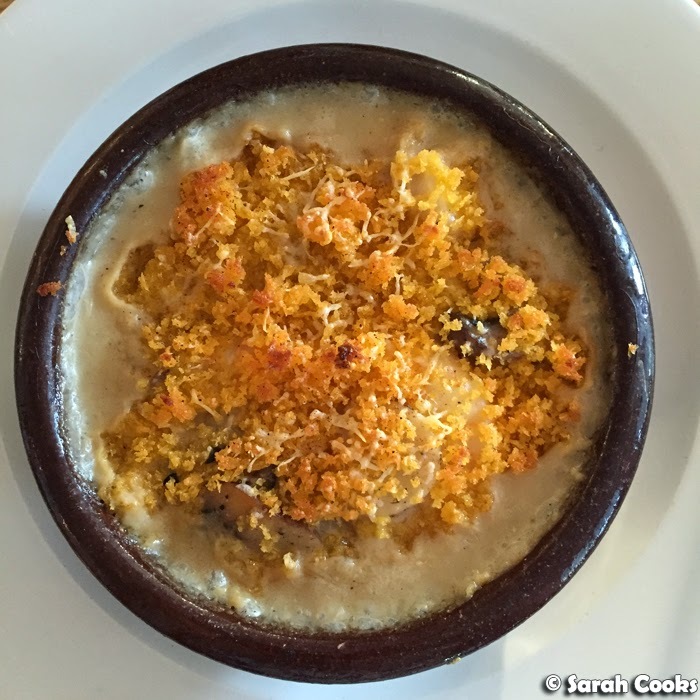 I ordered Bannisters fish pie as my main - a very luxe dish, full of prawns, fish, scallops, and mushrooms, smothered in a creamy truffled white sauce and gratinated with crisp bread crumbs. If I'd realised that the salad accompanying the steaks was so generously portioned, I would have skipped ordering a vegetable side for myself. Neither Sandra nor Kimba could finish their salads and we were happy to share. 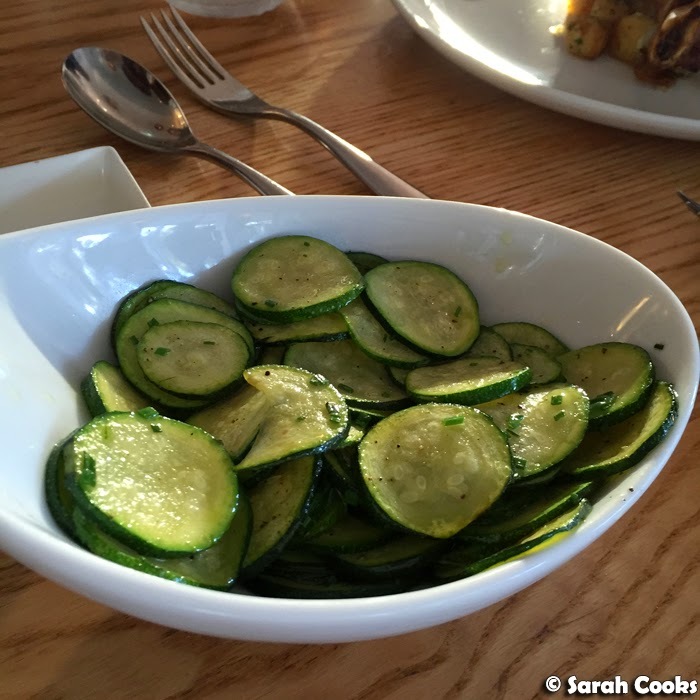 However, I still enjoyed the pan-fried zucchini with chives and olive oil. A simple combination of flavours. I could apply the same logic to the french fries and say we didn't need them, because the steaks came with crunchy potato cubes, but we ended up eating them all anyway. 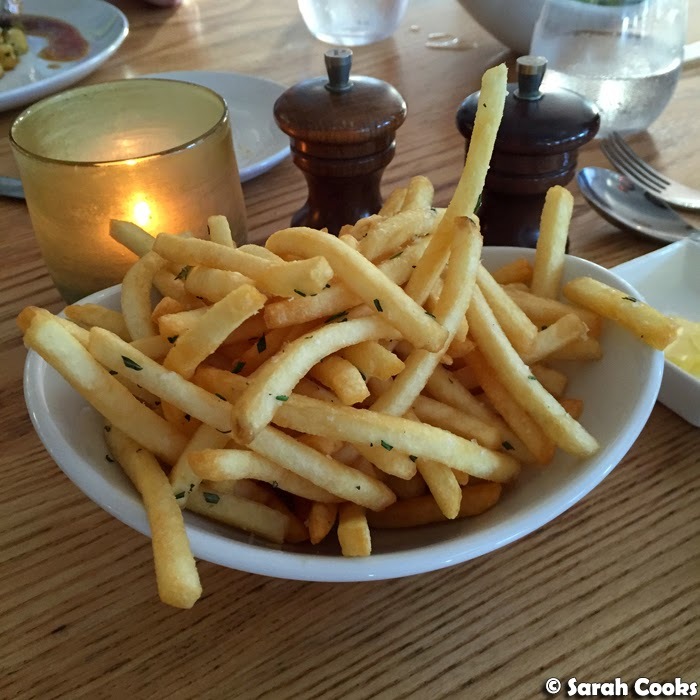 Because, you know, fries! 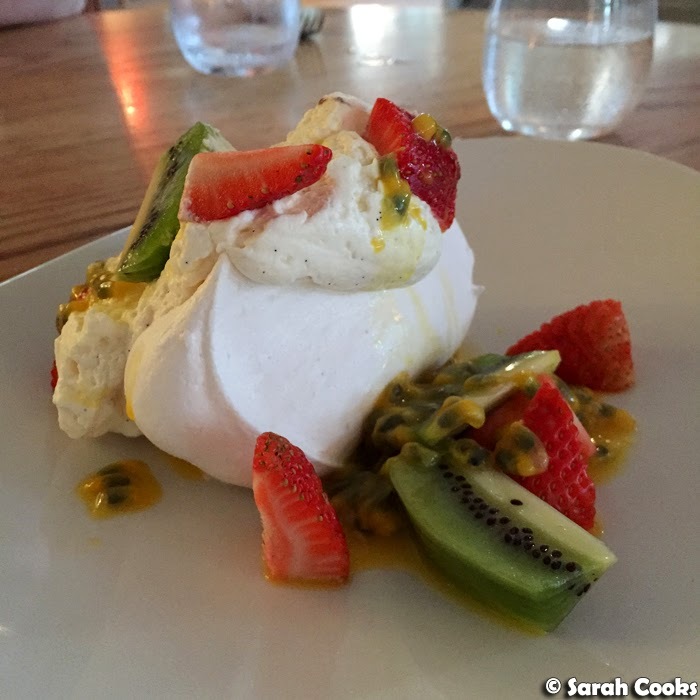 I never order pavlova at restaurants, seeing as I make it so often at home, but we all just wanted a little something something sweet to finish off the meal, and thought a little pavlova shared between the three of us would be just right. And it was! And that was our meal! 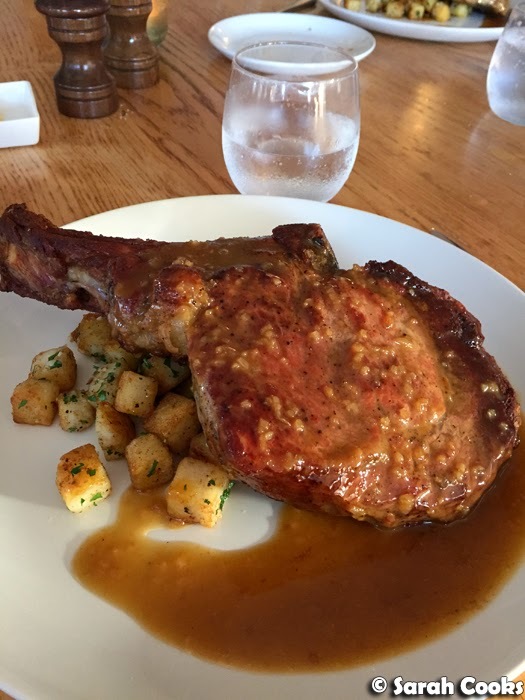 Very delicious, but quite expensive, and being a Sunday we were also slugged with a $10 per person service fee. I wasn't thrilled with the service fee, but I think such fees are standard in the ACT and NSW (? ), and suppose that high prices are to be expected when you've got a celebrity chef name, high-quality and locally sourced ingredients, and a lack of other fine dining options in the area. Overall, we really enjoyed our dinner at Rick Stein at Bannisters, and I'm so glad we made the effort to drive out for a little Treat Yo Self dinner! The service was friendly and prompt, and overall we had a really fun evening. It is quite expensive I agree. But those two sausages look so sad in that bowl! They are so delicious though but really they're sausages so I think a bit more wouldn't hurt and they would look less lonely! Great post. 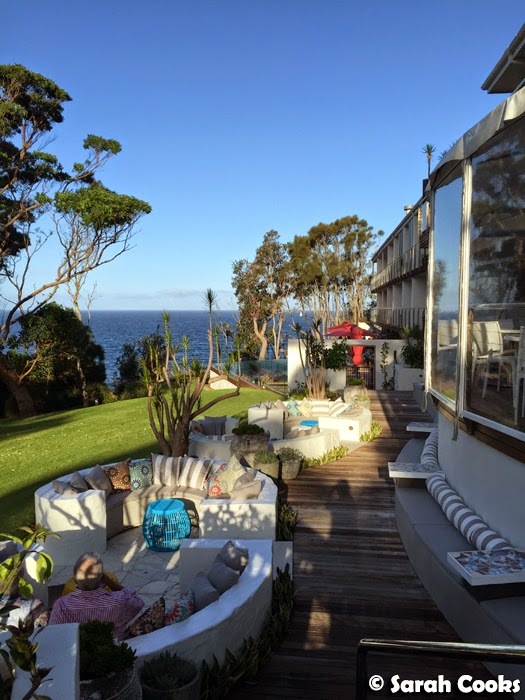 We are staying at Bannisters in a few weeks time and have booked to dine in the restaurant one night. Your review has made me even more excited! Oh, I'm jealous that you were able to go! I didn't go when I was in Jervis recently - it wouldn't really have been in the budget of my fellow companions on the weekend away. Next time maybe!